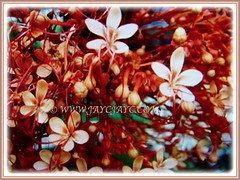 An everblooming shrub that flowers throughout most of the year in the tropical region. The showy and spectacular blossoms last for several weeks on the plant. Thus, it provides ample time for the gardener to enjoy the beauty of the flowers. Botanical Name: Clerodendrum paniculatum (syn. 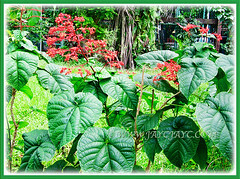 : Clerodendrum pyramidale/diversifolium, Caprifolium paniculatum, Clerodendrum paniculata). Common Names: Pagoda Flower, Orange Tower Flower, Hanuman Kireetam. Etymology: The genus name Clerodendrum is derived from the Greek words kleros meaning chance or destiny, and dendron referring to tree. The specific epithet paniculatum refers to the arrangement of flowers in terminal panicles. Origin: Native to Myanmar to Southern China and Southeast Asia, including India, Sri Lanka and Malaysia. It is popularly cultivated worldwide. 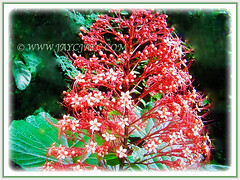 Features: Clerodendrum paniculatum is from the genus, Clerodendrum that consists of about 500 species of flowering shrubs. 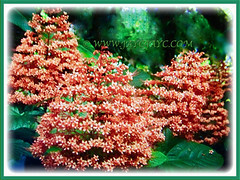 A fast-growing evergreen, erect and woody shrub that grows to between 1-1.5 m tall. The plant sometimes has multiple 4-angled brownish stems as new shoots arise from the roots. Its large palmately lobed leaves, measuring up to 30 cm are oppositely arranged and are glossy and deeply veined. Leaf blade is broadly ovate with heart-shaped bases and an undulating leaf margin. The petiolate leaves will emit an unpleasant smell. 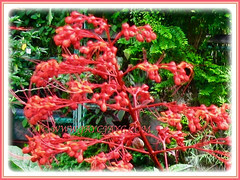 It produces huge spectacular clusters of orange-red or scarlet flowers that are held above the foliage in beautiful contrast. The trumpet-shaped bisexual and unscented flowers, measuring 1.5 cm wide occur in terminal panicles. The flowers within the pyramid-shaped cluster are tiered and shaped like Chinese or Japanese pagodas, up to 46 cm tall. Each tiny flower has a long tube and protruding stamens. The globose drupes or fruits are 5-9 mm in diameter. However, cultivated plants rarely produce fruits. 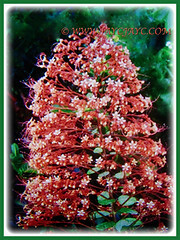 Culture (Care): Clerodendrum paniculatum or Pagoda Flower can be easily grown with minimum care. Others: Give it a hard prune occasionally to control its size and stimulate flowering. It is a big shrub that requires a large space. Protect the plant from very intense sunlight and strong winds. Generally free from serious pests and disease problems. Nevertheless, watch out mealybugs, aphids and nematodes. 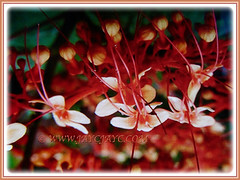 Clerodendrum paniculatum or Pagoda Flower is a returning perennial in zones 8b and 9. In frost free areas, it is a short lived, evergreen shrub. 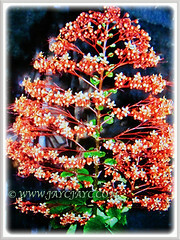 Armoured with good growing condition, the shrub will reward you with sporadic flowering all year long in frost-free climes. Water freely during the growing season but sparingly during winter. The plant will go dormant during the winter season but spring back when warm weather returns in spring. 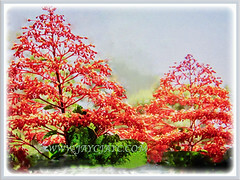 It flowers from summer through fall, presenting its magnificent display of long lasting pagoda-shaped blooms. Propagation: Easily propagated by stem cuttings or removal of suckers at the base of the plant and replanted as new plants. 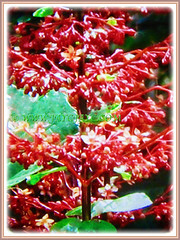 Usage: Clerodendrum paniculatum or Pagoda Flower is popularly grown as a landscape shrub because of its showy and spectacular inflorescences. Suitable as an accent or specimen plant in any garden. Ideal for container gardening, both outdoors and indoors. Grow in a flowerbed and garden border or in a mixed border, especially behind some low-growing shrubs. Its nectar is a magnet for bees, butterflies and hummingbirds. It has medicinal uses where the juice from the leaves and flowers is applied to insect bites to reduce swelling. Crushed leaves are used to treat dysentery and infected burns.